These buns are never-fail, always delicious, all-purpose (great for veggie burgers, with soups, dinner rolls etc…) and just plain good. I recently tried them ‘vegan-style’ (see options in recipe) and they worked out just fine. I also like to vary the ingredients a bit, using sunflower seeds in lieu of flax seeds, omitting the fresh rosemary and adding other herbs like savory and thyme instead. Just remember to keep the proportions the same and the ball of dough while kneading in machine should be a firm, not sticky texture (see notes below). Use your bread machine for so much more than just loaves of bread! Try these VERY easy to make delicious and fragrant buns. Makes 10 large “hamburger” buns or 20 small dinner rolls. Optional topping: 1 beaten egg, and poppy or sesame seeds. Place all ingredients (except toppings) in bread machine IN THE ORDER GIVEN, do not stir, adding yeast last (do not get it wet). Select the DOUGH cycle and start machine.At end of cycle (beeper sounds on most models) remove dough and knead lightly on a floured board for about 2 minutes. Cover dough with a damp tea towel and allow to ‘rest’ for 10 minutes. Divide into equal portions, depending on how many buns you want to make (see notes at top of recipe).Grease a cookie sheet or baking pan (use metal tins for even baking). Roll each dough portion into a ball, flatten for burger buns, only slightly for dinner rolls). Place on baking sheets, allowing about 1” between each bun. Cover with damp tea towel and allow to rise in a warm, draft-free until buns are doubled in size, about 30-40 minutes. Preheat oven to 350F for last 10 minutes of rising time. 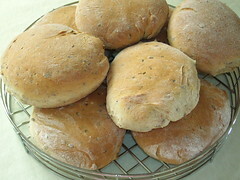 Optional: Brush egg lightly on risen buns, sprinkle with poppy or sesame seeds if desired. Bake for 20-25 minutes until golden brown. Cool slightly before serving (if you can wait that long!). Note: I use REGULAR dry baking yeast NOT the type specified for bread machines and have achieved better results and less problems with over-rising, when using bread machine. Also, when dough is mixing in machine it should form a smooth ball, not sticking to sides of bread container in the bread machine. Add a bit more flour or water during mixing cycle only, if required, to achieve the right dough consistency. Do NOT lift lid on bread machine during rising cycle. Reprinted from: Not Just for Vegetarians, Delicious Homestyle Cooking, the Meatless Way © Geraldine Hartman. These sound wonderful but ALAS, I don’t have a bread machine. Can you make them traditionally? I LOVE LOVE LOVE anything that has rosemary in it. It looks like you got your photos figured out! Yippee! Hi Kim, My advice, invest in a bread machine, you will LOVE it!!! As I said in the post, they can be used for a lot more than just loaves of bread, even pizza dough etc….perfect kneading, great results. I did need to ‘tweak’ the instructions that came with machine a bit. I don’t like using the bread machine type yeast, over-rises too much. The regular traditional dry yeast works great though, these buns DO taste as good as they look. Yes, Im glad to have the Flickr riddle figured out (sorta anyways….) Mitzi likes it too hahahah…. Your recipes always sound and look so tempting! I am going to make this one this afternoon. I’m hungry right now and these look terrific! Geraldine – The buns are delicious! My daughter and I just devoured one each. We tried to be good and each have one half, but that didn’t work! 🙂 I had to make several adjustments because I didn’t have the whole wheat flour, flax or sunflower seeds, or regular yeast. But the recipe still turned out great. Thanks for posting this recipe! Hi Beth,That’s the only problem with fresh baking, hard to resist. We don’t buy much commercial bread at any time. Especially when its so easy to make ‘the real thing’ hahaha.. Glad you and your daughter enjoyed the buns and good that they turned out well even with the minor adjustments. Will be featuring more recipes from my cookbook and also the cookbook contest winning entries soon so stay tuned. I second the motion, these buns are delicious….Im lucky to have a great cook to make them for me, on a regular basis. I plan to try making them myself soon, getting better in the kitchen and really enjoying the experience. Oh my gosh, they look so delicious. I don’t have a bread machine, ours broke– maybe for Christmas! Hi Caroline, They ARE delicious….Christmas is TOO far away. How about the kitties chip in for Meowmie Day (aka Mother’s Day) ? Mitzi suggestion but sounds like a good one. These will be a great treat for my husband who is on a restricted diet due to chronic constipation….the flax will do him well and he will feel like he is being spoiled! This does look good, and I have everything to make it. They will go well with my planned supper tonight. I labeled the recipe Geraldine’s Buns so I wouldn’t forget where it came from. Looking forward to giving this a try in the next few days. Thanks for posting. These buns sound delicious and a perfect way to use my bread machine more frequently.